I add tomato paste to make the chili rich. I also add three whole cloves while the chili is simmering. I love the hint of warm spice they impart. I take them out before I serve the chili. You could add a pinch to 1/8 teaspoon ground cloves. Sometimes I add a teaspoon or two of garam masala. This Indian spice imparts more flavor and warmth. Sometimes I add 4 or 5 dashes of Tabasco for a hint of heat. I taste the chili as it's cooking and make flavor adjustments. 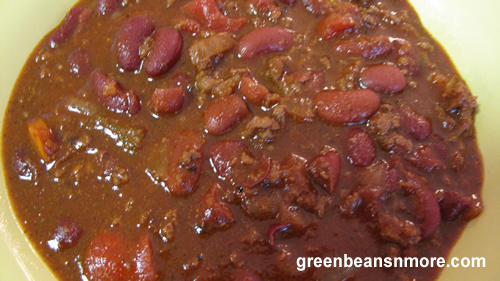 The best thing about chili is there isn't only one way to make it. You can give it a different hint of flavor every time you make it! Dice the onions. Brown the meat and onions together in a large pot. Drain off fat. Dice green pepper and add to pot. Add kidney beans, diced tomatoes, tomato paste and two cups of water. Stir well. Add seasonings, garlic and cloves. Stir well. Bring to boil, then turn down to simmer. Add more water as needed to obtain desired consistency. Let simmer 45 minutes to one hour.